The latest adaptation of Thomas Hardy’s 1874 novel of the same name is visually exquisite with a slew of fabulous performances – but does it to justice to the original story? Read on to find out (note: spoilers ahead for those that haven’t read the book). If you haven’t read much Hardy or at the very least have some acquaintance with his pastoral themed novels that explore the challenges of the English rural population in the 19th century you may be forgiven for thinking the film as a patron next to me summarized, is absolute batshit. Harsh but somewhat understandable commentary. Sitting between the batshit lady and my father (who is a huge Hardy fan and would constantly offer a running commentary) I had a slim hope of actually enjoying Thomas Vinterberg’s direction in this adaptation – but, surprisingly, for the most part I did. Carey Mulligan is Bathsheba Everdene, our heroine who through a fortunate role reversal goes from being a working lass with spirit to the mistress of a farm. Along the way she is courted by three very different suitors: the strong and unwavering farmer Daniel Oak (Matthias Schoenearts) who loses his wealth through a freak accident to his sheep; an aging landowner William Boldwood (Michael Sheen) who promises status, a neighbouring farm and dotage; and finally, the suave and desperate troubadour Francis Troy (Michael Sturridge) who sweeps Bathsheba off her feet with little more effort than a display of phallic swordsmanship amid the ‘hollow in the ferns’. However, unlike the all-consuming tragedy of Tess or the convulsive horror of Jude this is one of Hardy’s few novels that does have a happy ending – Bathsheba is saved from a life of misery with Troy thanks to Boldwood’s impromptu decision to step in (one that costs him a life behind bars) but it does free our heroine to spend the rest of her days in the arms of her unwavering sweetheart, Daniel. At least this is how the film reveals itself. The actual novel delves deep (read pages upon pages) into the complexities of navigating these romances and while the film’s stunning vistas capture some of the expansiveness of the English countryside there is flatness in dramatic arc and little historical context. 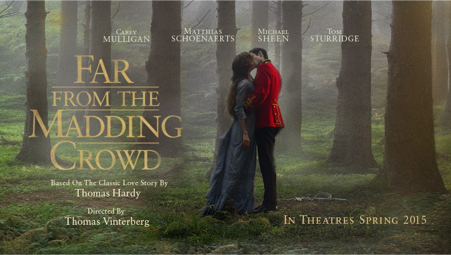 The tendency of incorporating key plot propelling moments (a proposal for marriage seemingly moments after introductions; a crazed sheepdog driving a flock over a mountainside; a Lazarus like return from the dead) with a few slapdash crowd shots and an inordinate amount of greenery gazing makes the film, despite its evocative images and remarkable score, rather plain fare. Mulligan is a fine actor and captures some of the emotionally nuanced revelations that her character experiences quite beautifully. However, if the character seems to have denied the honest but stalwart farmer in favour of maintaining her independence it seems a little strange, according to the screenplay, for our heroine to jump into a relationship with the local desperado – especially when a rich and seemingly kind and gracious suitor is also in line. Matthias Schoenaerts, despite his rugged good looks and strong silent charm seems to be strangely aloof from the rest of the farmworkers; a distance that serves well in some instances but downplays the community which is integral to any imagining of Hardy’s world. Similarly, Michel Sheen charmingly underplays his character yet his obsessive nature (preparing women’s clothes with Bathsheba’s name and procuring jewellery) and final act of cold blooded murder of his competition come as a surprise to a character who until then that would not be amiss in North and South. As the fiery soldier Michael Sturridge does little to cause any flames and his character seems to be little more than Jekyll-and-Hyde. Fanny Robins (Juno Temple) who was Troy’s betrothed is a waif almost faerie character whose death is touching as it is macabre yet her character is little more than ephemeral and the coffin-opening scene (one of the most gruesome and simultaneously captivating moments) is rendered lukewarm in Vinterberg’s attempt to keep this rendition realistic. The title of this fourth novel was taken from Thomas Gray’s poem Elegy Written in a Country Churchyard (1751) where Gray presumes that there is little to disturb the idyllic rural lifestyle and those in their graves are slumbering peacefully. Hardy with his incisive commentary and almost flamboyant sexual symbolism (nature, animals, the lot) deliberately disturbs the complacency of his readers and his audiences by highlighting just how rich and subtly weaved are the lives of those living at the cusp of industrialization in rural England. Ultimately Vinterberg’s film invites a comparison with the Schlesinger’s renowned 1967 version and although a detailed analysis is another conversation it is worth remembering (if you haven’t seen the original) that the tension of Hardy’s rough and unscaled depictions of rural life were admirably created through a highly surrealist portrayal. In contrast, this version is more along the lines of realism (again with an overdose of staring at the countryside) and it is perhaps this difference of style that neutralises some of the power in the film. In this 2015 version by Vinterberg the concerns of England at the time, including increasing mobility between the classes; emancipation of women and in contrast to perceptions of the time, the fact rural life was as riddled with questions of morality, ethics and gender roles; seems to have been eroded to the background. Instead the emphasis seems to have been character centric to allow Bathsheba and her choices to come to the fore. Interesting but certainly not powerfully all-consuming. The film as I mentioned despite the distraction, was enjoyable – but unless you are well versed with the original (either the novel itself or the 1967 film) it is likely to be compared to watching a young woman from the 19thcentury go on speed-dating with some rather disastrous results. Let my fellow patron (who had no inkling what the film would be like) and her comments give you due warning: Batshit. Absolute batshit.